Clear Creek Associates is one of the most accomplished groundwater modeling firms in the nation. Our modeling team members have combined experience of over 150 years, and have developed groundwater models that cover more than 10,000 square miles. Our hydrogeologists are experienced at constructing and calibrating reliable and defensible groundwater flow models used to assess past, present, and future groundwater conditions. Clear Creek hydrogeologists are also well-versed in the application of supporting software, subroutines, and graphical user interfaces, such as ArcGIS (ESRI), Excel spreadsheets, Surfer (Golden Software), Access, and Groundwater Vistas. The groundwater model development and calibration process incorporates verification of site-specific conditions through the evaluation of field data (maps and charts) of the geologic, hydrologic and infrastructure/demographic site conditions, along with consideration of unmeasured or inaccessible hydrologic parameters such as historical precipitation, evaporation, mountain front recharge, river flows, etc. 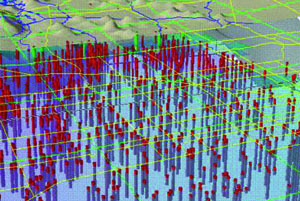 Clearly, the experience of our groundwater modeling team is critical to the efficient and cost-effective development of groundwater models. The Clear Creek Associates modeling team differentiates itself from our competitors by consistently demonstrating the technical skills and advanced professional insight that comes only from years of experience. - Establishing the presence of 100-year (or longer) groundwater supplies for residential or commercial developments. - Assessing well field optimization and well impact studies. - Assessing the impact of mining operations on local groundwater and/or surface water. - Predicting the ultimate open pit lake water level after the cessation of mining. - Forensic evaluation of groundwater contamination. - Design of groundwater remedies at environmental sites. - Predicting the percentage of groundwater versus surface water pumped from wells near perennial rivers or lakes. - Assessing the amount of groundwater mounding induced by Managed Aquifer Recharge projects.